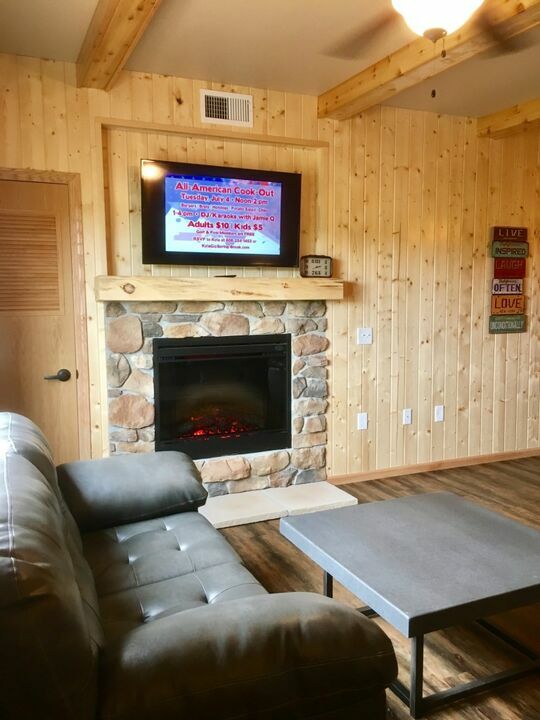 Escape the overcrowding and enjoy your next Dells trip with many of the conveniences of home. 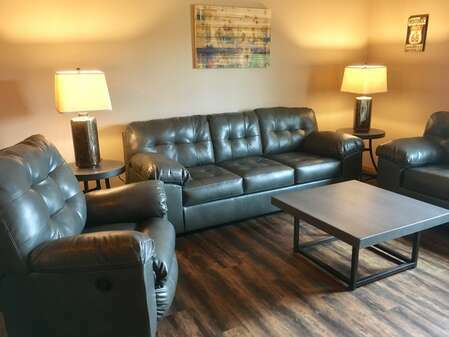 This sprawling three bedroom condo comfortably sleeps 14 (ADA unit sleeps 12). 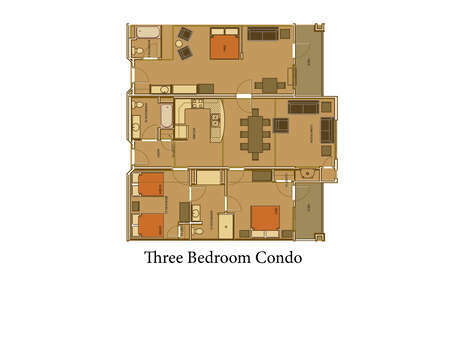 Sleep well in the Master bedroom - complete with a king bed, private master bath and 32 inch TV. For additional guests’ sleeping arrangements the second bedroom offers two queen beds and is also equipped with a TV. 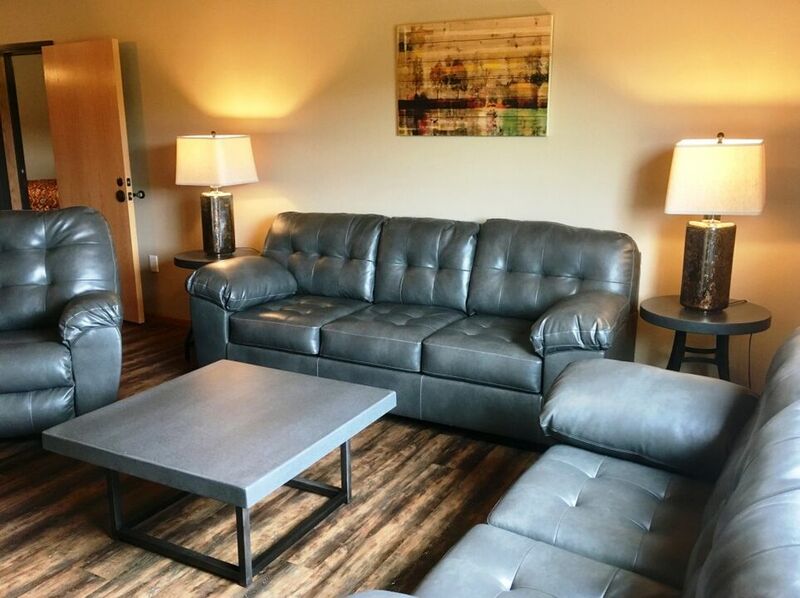 The third bedroom, or side suite, offers two additional queen beds (ADA unit offers one king), sofa sleeper, table and chairs, TV, mini fridge, microwave, coffee maker and a third full bathroom. 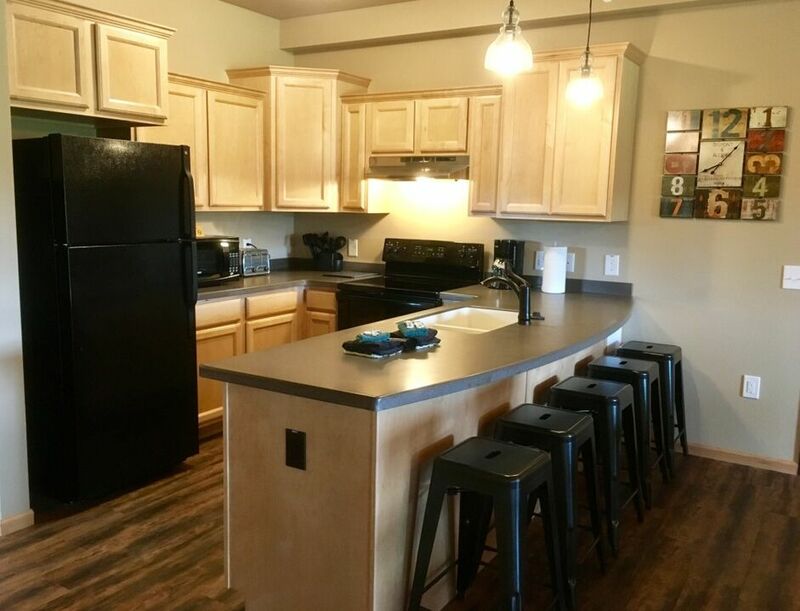 The well appointed full kitchen features Corian® countertops and name brand appliances including a refrigerator, stove, oven, dishwasher, and microwave. A standard coffee maker, toaster, blender and a full set of eating utensils and cookware are supplied. The dining area provides a large extension table with seating for eight. Additional guest seating is available at the kitchen counter. The pine accented wall in the living room pairs well with the stone fire place, 42 inch television and queen-size leather sleeper sofa. A love seat, accent chair and coffee table -great for entertaining- complete the cozy living area. In addition to the aforementioned bathrooms, there is a third full bath in the common area. 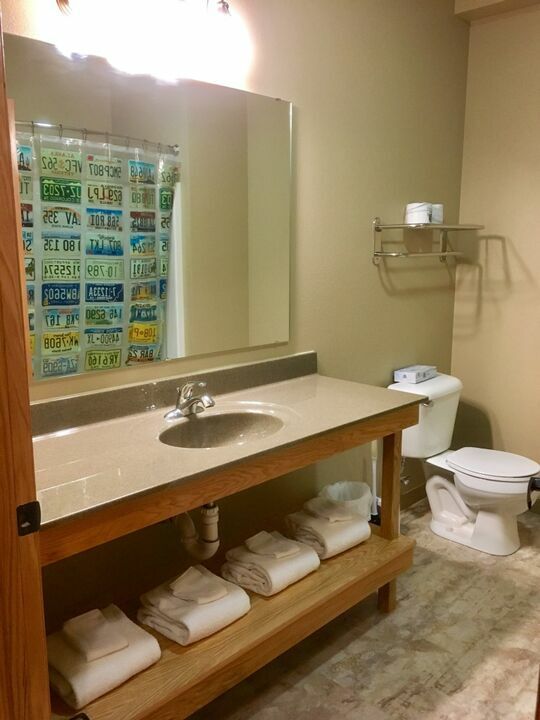 All are fully stocked with towels, toiletries, and a hair dryer (ADA unit comes with one universally accessible bathroom). For added convenience an iron, ironing board and washer and dryer are also provided. Home and office are just a click away with complimentary WI-FI. Or grab a cocktail and leave it all behind at the outdoor seating provided on the two balconies. The Cedar Stone Condos-Suites are directly across the street from Spring Brook’s Clubhouse, which is home to the Spring Brook Sports Bar & Grill, indoor/outdoor pools, fitness room, golf course and pro shop. 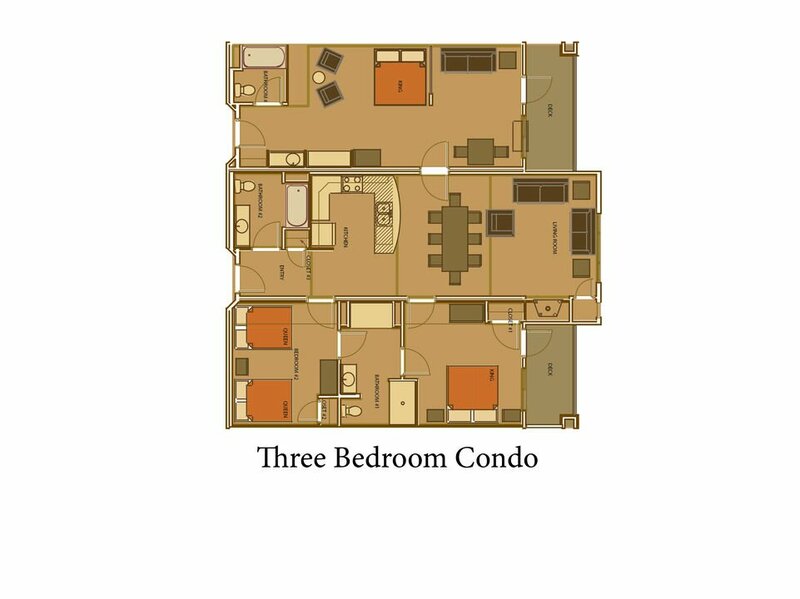 Condo sleeps maximum of 12 (ADA), rates based on 8 people over the age of 3. Extra guest fee of $15/night per additional guest applies. Memorial Day and New Years Eve Holidays require $250 Security Deposit.